What Is Sew In Hair Weave? "What is sew in hair weave?" Sew in hair weave is a type of hair weave that is attached to the wearer's head by means of sewing. Sometimes the weave is sewn into canerows (cornrows) on the wearers head, other times the hair weave is sewn onto a net (that has already been sewn onto the cornrows (canerows) on the wearer's head. Sew-in hair weaves can either be hand tied or machine tied. In the machine tying process, strands of hair often known as loose hair or bulk hair are fed through a sewing machine to create a reinforced stitch (a bit like very thin shoe lace) at the top of the hair. The hair is then folded over and stitched again to create the final wefted hair extensions which look like a curtain of hair. The terms weave weft relate to the fact that hair has been joined by weaving thread to tie the hairs together to make a (flat not bunched) continuous piece of hair extensions. "Is sew in hair weave different to other types of hair weaves?" Um... this seems like one of those questions, where it looks like you could be asking at least two things...so we'll be troopers and answer both questions firstly whether there are different types of hair weaves and secondly the different types of attachment for hair weave. Not all hair extensions are hair weaves. "Can sew in hair weave be glued instead of sewn?" Yeppers. 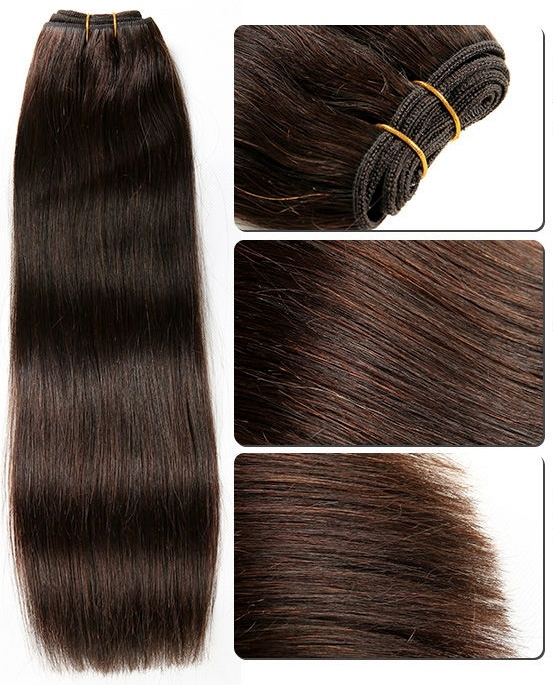 As mentioned above, hair weave is just hair weave which can be sewn or glued onto your hair. Sewing hair weave onto your own hair provides a longer lasting attachment than bonding glue and (if done correctly) shouldn't cause any damage to your own growth hair. If you're choosing to use bonding glue to attach your hair weave then you might want to consider whether you'd prefer single tied wefts or double tied wefts. Single tied wefts typically have less hair than double tied wefts - this has the advantage of there being less pull on your own growth hair and creating less bulk especially near the crown of your head. Double tied wefts typically have more hair than single tied wefts - this has the advantage of creating a fuller look, but sometimes double tied wefts may also contribute to the hair weaves appearing as bulky around the crown of the head. If you're super keen to find out the basic steps in the process of using bonding glue with hair weaves, then you're in luck as there's an article outlining the process of using bonding glue to attach hair weave - hooray! "Is there synthetic sew in hair weave?" The general rule of thumb when it comes to wigs, hairpieces and hair extensions (hair weave is under the umbrella of hair extensions by the way) is that if it comes in a human hair version, there will absolutely be a synthetic hair version. That synthetic version, may not be heat resistant, but it will defo be synthetic and more affordable than its human hair counterpart. Synthetic hair weaves work in the exact same manner as human hair weaves but they're rarely manufactured through hand tying - synthetic weave hair is almost exclusively machine tied. Okeydokey, that's your lot for now, but there are more answers to your hair weave questions for you to peruse if that's what suits and if you want to be the first to know about our next hair weave guide or anything else to do with lace wigs, hair extensions or hairpieces, then why not join our blog, it's easy to do and doesn't require an email address.